Each year, hospital-acquired infections, prescribing and treatment errors, lost documents and test reports, communication failures, and other problems have caused thousands of deaths in the United States, added millions of days to patients' hospital stays, and cost Americans tens of billions of dollars. Despite (and sometimes because of) new medical information technology and numerous well-intentioned initiatives to address these problems, threats to patient safety remain, and in some areas are on the rise. In First, Do Less Harm, twelve health care professionals and researchers plus two former patients look at patient safety from a variety of perspectives, finding many of the proposed solutions to be inadequate or impractical. 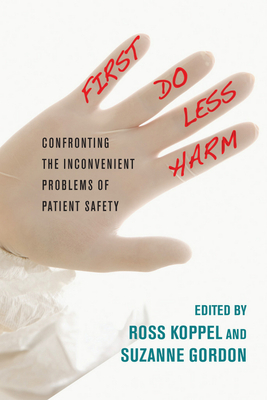 Several contributors to this book attribute the failure to confront patient safety concerns to the influence of the "market model" on medicine and emphasize the need for hospital-wide teamwork and greater involvement from frontline workers (from janitors and aides to nurses and physicians) in planning, implementing, and evaluating effective safety initiatives. Several chapters in First, Do Less Harm focus on the critical role of interprofessional and occupational practice in patient safety. Rather than focusing on the usual suspects--physicians, safety champions, or high level management--these chapters expand the list of "stakeholders" and patient safety advocates to include nurses, patient care assistants, and other staff, as well as the health care unions that may represent them. First, Do Less Harm also highlights workplace issues that negatively affect safety: including sleeplessness, excessive workloads, outsourcing of hospital cleaning, and lack of teamwork between physicians and other health care staff. In two chapters, experts explain why the promise of health care information technology to fix safety problems remains unrealized, with examples that are at once humorous and frightening. A book that will be required reading for physicians, nurses, hospital administrators, public health officers, quality and risk managers, healthcare educators, economists, and policymakers, First, Do Less Harm concludes with a list of twenty-seven paradoxes and challenges facing everyone interested in making care safe for both patients and those who care for them.